SpaceX called off a try Sunday to launch a package of Orbcomm communications satellites from Cape Canaveral, eyeing a better chance to land the Falcon 9 rocket’s first stage booster Monday, according to Elon Musk, the company’s billionaire founder. Launch crews were preparing for liftoff Sunday evening, but Musk tweeted a few hours before the scheduled launch time that the mission would slip until Monday. Musk said a Monte Carlo simulation run, a type of probabilistic computerized mathematic model, showed a 10 percent better chance of nailing the Falcon 9’s first stage landing at Cape Canaveral on Monday. When it blasts off, the launch will mark the first time an the booster stage of an orbital rocket will attempt to return to a landing site near its origin. After reviewing the mission parameters, Musk announced the company will wait until Monday for a better chance at returning the first stage to Landing Zone 1, a site less than six miles south of the Falcon 9 launch pad leased by SpaceX from the U.S. Air Force. 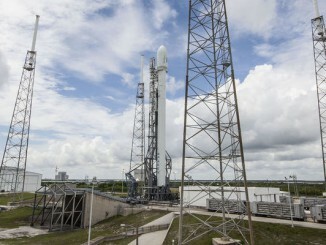 But the recovery is a secondary objective on the launch. 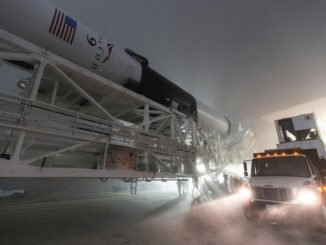 The prime goal is the deployment of Orbcomm’s 11 message relay satellites, and the demonstration of an upgraded version of the Falcon 9 designed to lift heavier payloads into orbit. It is also SpaceX’s first launch since a Falcon 9 rocket disintegrated in shortly after departure from Cape Canaveral in June. SpaceX engineers blamed a strut inside the upper stage’s liquid oxygen tank, and the company said it instituted measures to fix the problem. In a separate statement, Orbcomm said that SpaceX ordered the one-day delay to give engineers an opportunity to crunch data relating to the launch. 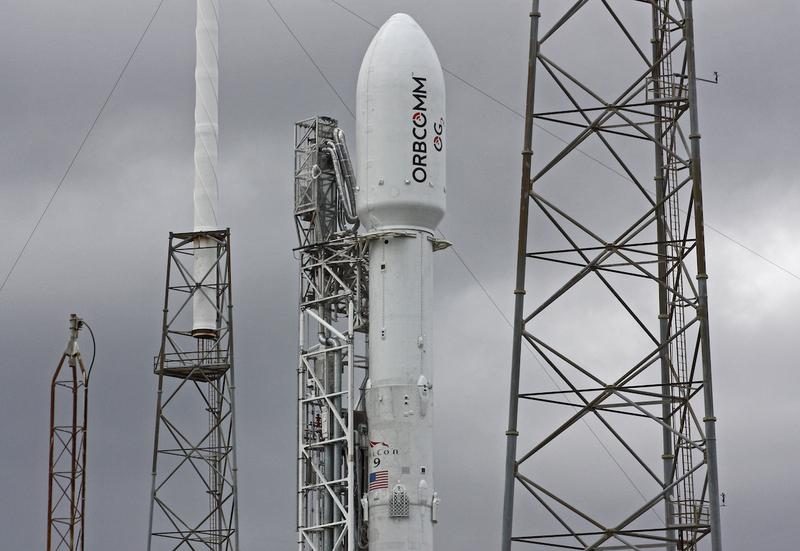 “Upon further review of the static fire data, SpaceX has determined that an additional day prior to launch will allow for more analysis and time to further chill the liquid oxygen in preparation for launch,” Orbcomm said in a brief update posted on its website. Orbcomm did not address the landing attempt in its statement. SpaceX targeted a static fire test of the Falcon 9 rocket on its launch pad Wednesday, but problems pushed back the critical prelaunch milestone until Friday. The launch team puts the Falcon 9 rocket and its ground support systems through a thorough countdown test during the static fire, culminating in the ignition of the rocket’s nine Merlin 1D first stage engines for several seconds while restraints keep the booster on the ground. The modified Falcon 9 rocket slated to fly the Orbcomm satellites into orbit features several changes from earlier versions of the launcher. One of the new features is the consumption of super-chilled propellant by the Falcon 9’s rocket engines, which burn a mixture of rocket-grade kerosene — called RP-1 — and liquid oxygen. 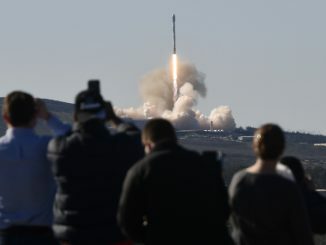 Musk said last week the launch preparations were slowed by trouble with the propellants, but the launch team apparently overcame the snags during Friday’s successful static fire test. In posts to his Twitter account, Musk said the RP-1 fuel was chilled to 20 degrees Fahrenheit on the upgraded rocket, down from 70 degrees on SpaceX’s previous launches. The liquid oxygen is also colder, stored at minus 340 degrees Fahrenheit, closer to its freezing point than the more standard minus 298 degree temperature for the cryogenic oxidizer. Mostly cloudy skies are expected for Monday night’s Falcon 9 launch opportunity, which comes in a 60-second window opening at 8:33 p.m. EST (0133 GMT Tuesday). There is an 80 percent chance of acceptable weather, slightly less than Sunday’s attempt. But most of the heaviest precipitation should remain away from Cape Canaveral Monday evening. “The front should remain south of the Space Coast until overnight Monday and into Tuesday keeping the unsettled conditions, rain showers and isolated thunderstorms to the south as well,” the forecasters wrote. The primary concerns Monday are with the cumulus cloud rule associated with isolated coastal rain showers and the thick cloud rule due to the frontal boundary’s possible northern movement back into the area, according to the Air Force. The forecast calls for some light rain showers in the vicinity, scattered clouds at 3,000 feet and 10,000 feet, and a broken deck of clouds at 25,000 feet. Winds should be from the east-southeast at 10 to 15 mph, the launch time temperature is expected to be 72 degrees Fahrenheit, and visibility is forecast to be 7 miles.